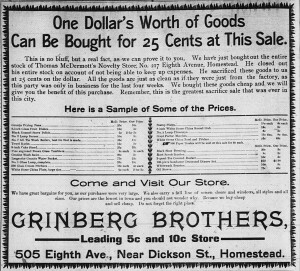 This ad for the Grinberg Brothers store ran in the Homestead paper 5/26-5/28/1898. It was the first of many, many such advertisements to come. Barry Reese is the great-grandson of Solomon Grinberg, brother to the original Grinberg brothers of Homestead, Meyer and Morris, who settled in Homestead with their father in 1893. He and his brothers, Ralph (Henry) and Jeffrey, grew up in Munhall with their parents, Rita and Edward. The boys attended Hebrew school, and their parents were active at the shul. The best part? They took video of some of the community events they attended! Barry guesses that the video below includes: a sisterhood dinner in the late 50’s, maybe a 1959 Purim luncheon, some synagogue event from 1960, and a 1965 sisterhood dinner. But many of you reading were there! Or your parents were! Can you help identify the events and the people? Do you think this tablecloth is on the banquet table in a couple of the clips? 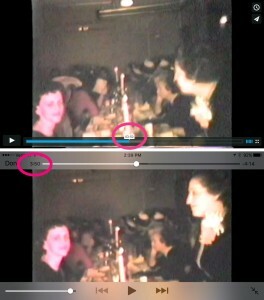 Click to see where to find the video time on a computer (top) or phone (bottom). I will update this post with everyone’s responses, so we can remember all our friends and family for posterity. Some are in the comments below. Others were told to me directly. The “rabbi” for the mock wedding was Yetta Stein. Ruth Gross seems to be the lady telling the wedding party when to come out onto the walkway. Harry Weinberger was in the audience. My father believes he recognized his aunt and uncle, Sam and Florence Hepps. Thank you, Barry, for digitizing your family’s home movies for us! Homestead Hebrew Congregation, 1959-1965 from Tammy Hepps on Vimeo. Thanks, Tammy. I thought you were coming to Boston this fall and would look at the rest of the items I have from the Grossman family. Let me know if and when. Dear Tammy, the first picture of the mock wedding ….the bride in white, is my Mom Hazel Weinberger. In the original photos , which I had and tried to find for you , shows her with a blacked out front tooth..carrying a bouquet of floppy carrots and some other vegetables. I used wedding photos for a Purim spiel in Allentown and can’t find photos now. Wow, Hi Ellie- I remember your mom so well. Wonderful to see this. Wow, Tammy, I am blown away to see these How amazing to see my beautiful mom and dad and the beloved chevre.. oh my! I Think that is me singing! It is my mom at the doorway guiding people in…Florence Solomon Segall! I did not see my grandfather Harry.. still looking. Thanks Barry for doing these. I love the Reese family.. wonderful to see Barry’s mom, Rita.